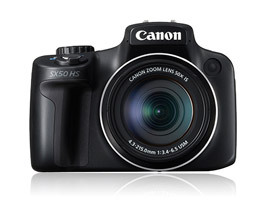 Canon’s new bridge camera, the 12.1-megapixel PowerShot SX50 HS is a portly looking thing, especially considering the miniaturization trends influencing everything from DSCs to DSLRs. Its bulky size – weighing 595 grams and measuring 122.5 x 87.3 x 105.5 mm – can partly be explained by its optical zoom, which is the industry’s first to reach a whopping 50x, or a 35mm equivalent of 24-1200mm! Despite the camera’s eye-popping telescopic-like focal length, it is slightly hindered by its aperture range of f/3.4-f/6.5. The restricting apertures could prove difficult in low light environments, but Canon provides SX50 HS users with ISO settings spanning 100-6400, in addition to optical image stabilization. The SX50 HS also gets some of its girth from its articulating 2.8-inch LCD screen. The monitor has a display resolution of 461k-dots, a little on the low side considering newer DSC models are approaching 1-million-dots in resolution. The display also isn’t a touchscreen, another oddity that goes against current conventional DSC wisdom. Regardless, the swiveling LCD screen of the SX50 HS will assist users in shooting video, which delivers 1080p Full HD quality. • Optical zoom with a 35mm equivalent to 24-1200mm! • ISO range of 100-6400. • 2.8-inch articulating LCD touchscreen with 461k-dot resolution. • Full HD 1080p video with stereo sound.